Cheese is a milk curd generally pressed into cakes and cured for use as food, presented in a variety of ways, and its types are many, belonging to the following categories; for making a cheese plate you have to choose one from each of them, with one familiar type like Brie or Aged Cheddar. Or, in its place, you can choose one cheese from each type of milk got from sheep, goat or cow so different flavours are included in your plate. Traditionally, Cheese Plate is served more than once in the course of an event, and prior planning is necessary about the number of times of its serving. 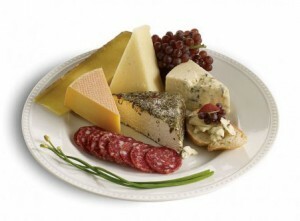 One serving may be as an appetizer on buffet fashion having regard to your guests’ appetites; another serving can be as light meal involving two to three ounces of each type of cheese per head; cheese served as a dessert course will take only 1-1.5 ounces as above; and serving cheese plate as a course is another practice. Here, arrangement of cheeses must be from the mildest to the strongest, clockwise, down and around. For a big cheese plate, your mildest will find a place next to strongest. The strongest on the plates are always blues coming next by washed rind cheeses. And as a rule, you are to keep the cheeses well inside the rim to avoid any unsightly look. Accordingly, position your cheeses in artistic ways on a wooden or bamboo cutting board, adding dry fruits and toasted nuts, and serving bread on one side. Including extra items like wine jelly, fig cake, Italian mostarda, toasted nuts, quins paste, apple or pear slices, date cake and any of today’s popular cakes accentuates the flavour of cheese. Always use a cheese knife, which is safer. A few formulae helping preparation of palatable cheese plate are quoted here for information. Flavoured crackers with mild cheeses for enhanced flavours; seedy crackers with goat’s cheese, or Baguettes pieces with easily spreadable cheeses (brie); maple syrup and honey with soft fresh cheeses such as feta; blue cheeses with praline bacon or nut brittle; hard cheeses with spicy foods such as apple mustard; and apple slices with brie and camembert; and thinly sliced onions for complementing blues. Capping a cheese plate with drinks is customary. • Though water is the normal choice for non-alcoholics, wine is the most preferred drink of guests. Wine combined with cheese course gives you sensational movements on the occasion. • Nothing surpasses taking dessert wines such as Port, Tawny Port, late Harvest Zin, Muscat and Sauternes along with strong blues. • For syrupy dessert wines, stronger cheeses are the combination. And for cheese plates at the end of the meal, the last wine served at the entree (main American meal) can be with a dessert. © 2019 Cheese Plate. All Right Reserved.